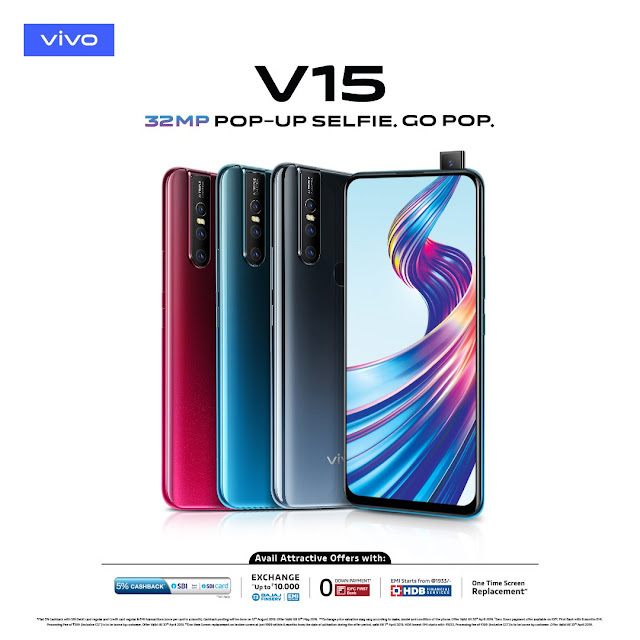 Vivo V15 has launched in India after the successful launch of Vivo V15 Pro last month. On Friday Vivo officially announced the launch of Vivo V15 and also said that the pre-orders for this phone will start from next week. Originally Vivo V15 launched in South-East Asia earlier this month. This Vivo V15 is different from Vivo V15 Pro in so many aspects which include screen size, triple rear camera, battery size and more. Vivo V15 price in India and Offers. The price for Vivo V15 in India is set Rs 23,990 and three different colors – Frozen Black, Glamour Red and Royal Blue. The company announced that Vivo V15 will be available for Pre-order from Monday, March 25 and fully available from April 1. The phone will be available of Vivo India e-store, Amazon, Flipkart, Paytm Mall, Tata CliQ and all other channels. There are so many launch offers Vivo V15 buyers will get such as free one-time screen replacement, up to 15-month no-cost EMI, extra exchange value of Rs 2,000, and Rs 1,000 loyalty benefit over exchange value, Rs 10,000 Reliance Jio which include 3.3TB data and number of offers from different banks. >> Dual SIM (Nano) support. >> 6.53-inch full-HD + 1080x2340 pixels with 19.5:9 aspect ratio. >> Corning Gorilla Glass 5 protection. >> OS 9 based on Android 9 Pie. >> Powered by octa-core MediaTek Helio P70 SoC + 6GB RAM. >> Triple rear camera setup – 12-megapixel (dual-pixel) primary sensor with f/2.4 lens + 8-megapixel sensor with f/2.2 lens + 5-megapixel sensor with f/2.4 lens. >> Pop-up selfie camera with a 32-megapixel sensor and f/2.0 lens. >> 64GB inbuilt storage expandable via microSD up to 256GB.